Following the first detection of Schmallenberg virus (SBV) in North Rhine-Westphalia, Germany, in 2011, an epidemic of abortions, stillbirths and congenital malformations was reported through European Union (EU) as a result of a wide SBV circulation (Figure 1). In Italy, as soon as the first confirmed cases were notified in EU countries, the Ministry of Health provided indications to enforce passive surveillance in all farms with ruminants, particularly in those that had introduced live animals from affected countries (Nota Min Sal 4th April 2012). National Surveillance program is focused on reinforcement of clinical observation in flocks and herds, mainly to abortion, stillbirth and congenital malformation in lambs, calves and kids. Fever, drop of milk production, diarrhea are usually observed in adult ruminants. Serological and virological tests are carried on samples collected in each farm with clinical suspect and samples activities involving farms within 4km of radius. As defined in the Ministry Notes, laboratory confirmation of suspected cases is performed by The National Reference Centre for the Foreign Diseases of Animals (CESME) in thel’Istituto Zooprofilattico Sperimentale dell’Abruzzo e del Molise “G. Caporale”, Teramo. The 16th of February 2012 the first case of Schmallenberg virus infection was identified in a farm in the Province of Treviso in Veneto region. SBV was detected by RT-PCR in the brain of an aborted goat with subcutaneous edema arthrogryphosis and ankylosis of limb joints. Diagnostic tests performed on the ruminants housed in the farms (1 cattle and 5 goats) excluded any active viral circulation. However the SBV infection was confirmed by the detection of antibodies in serum samples. Again in Treviso province, seroconversion was detected in a cattle which gave birth to a calf dead 24 hours postpartum. The newborn tested negative to the Real Time RT-PCR test specific for the SBV genome. On April 2012, in a dairy cattle farm in the Province of Treviso, a stillborn calf was RT-PCR positive for the Schmallenberg virus and the SBV circulation in the area was confirmed a few months later, in August, when SBV was detected in the blood of cattle in province of Belluno. An intense viral circulation was reported in Sardinia. Almost 100 SBV outbreaks were confirmed from November 2012 to March 2013 in 7 out of 8 Sardinian provinces. The infection was mainly confirmed in sheep and goats flocks showing clinical symptoms as abortion, stillbirth and malformations (arthrogryposis, brachignatia, torticollis and scoliosis). 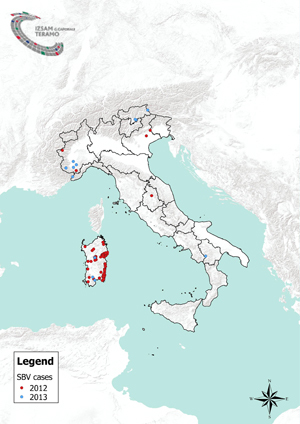 Viral circulation involved other Italian regions: Piemonte where 6 outbreaks were confirmed in the provinces of Torino (2) and Cuneo (4) (Figure 1) while in Trentino Alto Adige 3 calves and 1 goat kid tested positive to RT-PCR test. Anti-SBV antibodies were detected in cattle herds located in Umbria, Basilicata and Liguria regions. SBV genome was detected in pools of Culicoides collected from June 2011 to June 2012 during the entomological surveillance activities carried out for bluetongue virus. Retrospective investigation were conducted onCulicoidescollected from June 2011 to June 2012. Collections have been performed in six cattle farms located in Veneto and Friuli Venezia Giulia within a radius of about 50 km from the first SBV case. Viral genome was detected in pools consisted of midges belonging to the Obsoletus complex. In detail: 1 pool was collected in Caneva (Pordenone), 1 in Istrana (Treviso) and 4 pools in a farm in Feltre (Belluno). Moreover RT-PCR confirmed SBV in a single midge belonging to the C. obsoletus sensu stricto species, collected in Feltre, on May 11th. 2012.The results of the survey demonstrated that SBV circulated in at least 3 Italian provinces as early as on September 2011, nearly five months before and 40 km far from the first SBV clinical cases. The survey detected also the presence of virus in vector population 3 months after the notification of first SBV clinical cases. An active entomological survey was performed in Sardinia from 30th October to 5th December 2012 and allowed SBV detection in 3 pools of C. Imicola collected in Carbonia-Iglesias province.